I’ve mentioned before that I regret not asking my grandmother for copies of her recipes; honestly, I felt like that indomitable old lady was too tough to die, until the very day that she passed away. As I grew up, I did less and less cooking with her — she would cook for me or I for her, but rarely did we cook together anymore. It became all that much more difficult once my attention (and hers as well) was focused on my children. I didn’t realize that it would be something I missed so much. White pan rolls straight out of the oven. In Nan’s memory, I’ve been trying to recreate her famous pan roll recipe. Whenever we were in town, or she was visiting us, Nan was always the one to cook Sunday dinner (which was always understood to mean “roast beef dinner”). Her fresh rolls were an integral part of that meal, and came to be considered by all the family as the proper accompaniment. She would start the dough and leave it to rise before she left for church in the morning, then punch it down and form the rolls immediately upon returning home. It was a Sunday ritual. White flour pan rolls after the second rise. 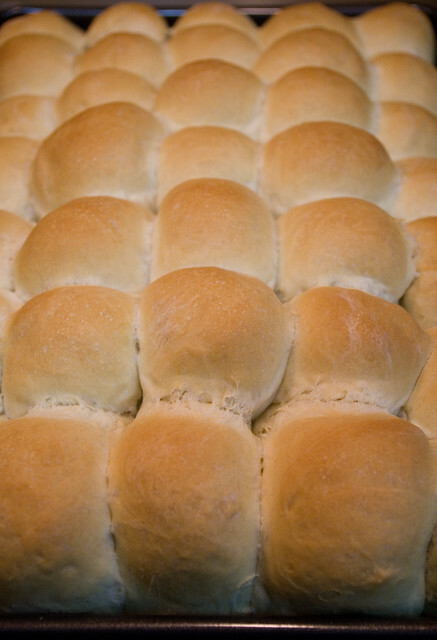 To me, pan rolls should be squished as tightly as possible into their pan so that, when they rise, they rise upward and become tall and skinny once they are pulled away from their fellows. They should be yeasty, but not too fluffy, and fairly filling. They should be golden on top, crispy around the edges, and soft (but not raw) in the middle. With this recipe, I think I’ve made them as close to what Nan made as I possibly can. 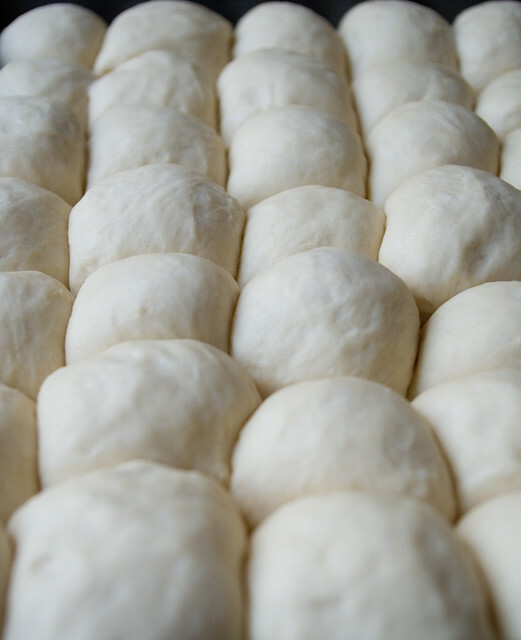 White pan rolls after the second rise. Stir by hand until mixture is more-or-less smooth. If the dough starts to become tough to knead, do not add any more flour. When flour is fully incorporated, dough should be smooth and elastic, but not sticky. If dough is sticky, add all-purpose flour 1 Tbsp at a time until stickiness abates. Whole wheat dough divided in half and made half into pan rolls, half into a loaf of bread, after the second rise. Turn out dough onto a lightly floured surface and knead by hand for about 8 minutes. Oil a large mixing bowl. Form the dough into a ball and place it in the bowl. Cover the bowl with a clean, damp tea towel. Place the bowl in a warm, dry area with no drafts. Allow the dough to rise until double, about 1 hour. Punch down the dough. Grease a 9″x13″ cake pan. Divide the dough into 35 approximately equal-sized portions. Form the portions into balls and place them in lines closely together to fill up the cake pan. ** Cover the pan with a clean, damp tea towel and allow to rise again until double, about 1 hour. Whole wheat loaf after baking. Preheat your oven to 450ºF (232ºC). 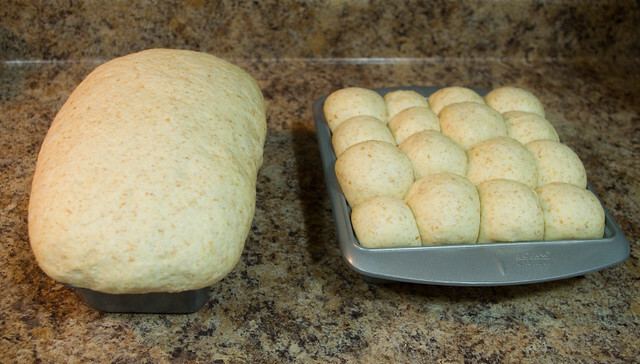 Bake rolls for 10 minutes. Turn heat down to 350ºF (177ºC) and bake for about 20 minutes more. Check to see if they are done by removing the rolls all in one piece from the pan and tapping them on the bottom. When cooked through, they should make a hollow sound. 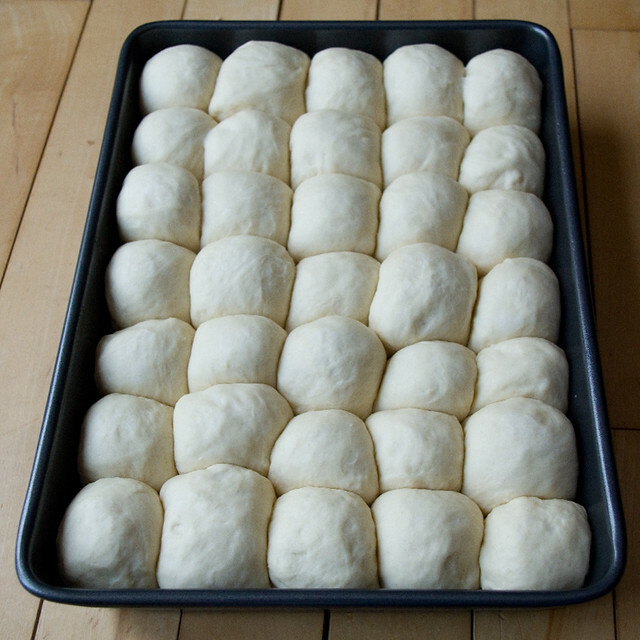 Remove the rolls from the pan immediately and place them on a wire cooling rack. Rub the tops of the rolls with the butter, keeping the waxed paper between the butter and your hand. Nan’s pan rolls taste best when served immediately; to keep them at their freshest, pull them apart only when they are about to be eaten. These rolls will keep for three or four days if wrapped in a clean plastic bag. Make sure they are wrapped up only after totally cool, or they will go soggy. Whole wheat pan rolls being pulled apart by my temporarily-tattooed Thing 1. 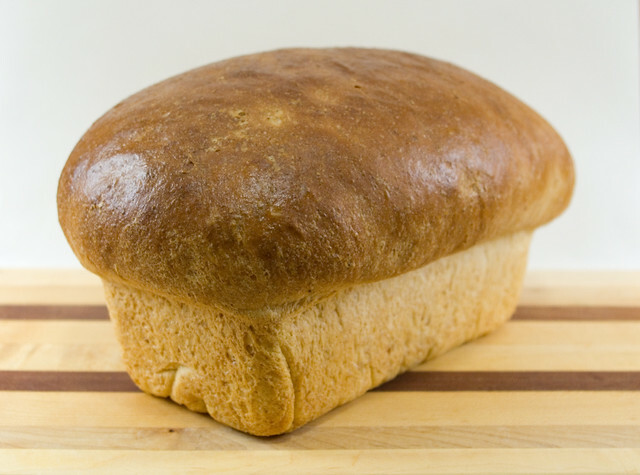 *For whole wheat bread, replace the first 4 1/2 cups of all-purpose flour with all-purpose whole wheat flour. **Alternately, this recipe makes two good-sized loaves of bread. I used a slightly too-small loaf pan to create a “mushroom-top” loaf; if you want your loaf to have smoother sides, use a pan that is at least 9.5″x5.5″. 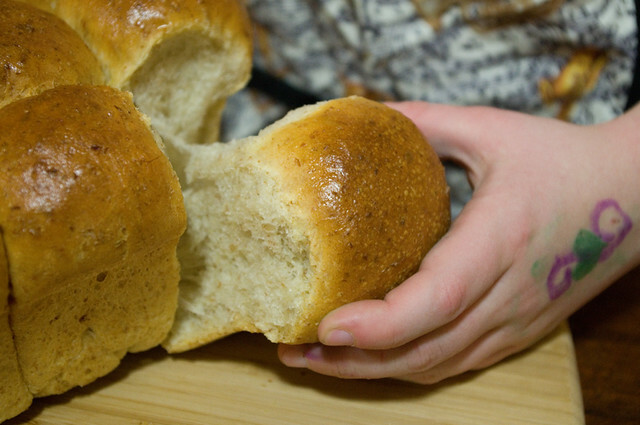 You could also make three smaller loaves in smaller loaf pans instead of two big ones. Allow the loaves to have a second rise as per pan roll instructions. Be careful of cooking times if you change the shape of the end product. Bread loaves will take 10min at 450ºF (232ºC), and then they must be turned down to 350ºF (177ºC). However, how long they stay in at 350ºF depends on the size of loaves you make. When in doubt, bake for less time and check often to see if they’re done. Posted on March 8, 2017 May 3, 2017 by owntwohandsblogPosted in Cooking, RecipesTagged baking, bread, food, recipe, traditions. oh my goodness, I’m not much of a baker but seeing these rolls makes me want to get really good at it,wow, just wow! Glad you like it! I’m on Facebook as https://facebook.com/owntwohands. You can find all of my posts linked there as well for easier sharing.